The builder called with the color for a house I had to prime. It was a Glidden color. He provided the name and number of the color. I went to Home Depot to get the Glidden color mixed in Behr Premium Plus Eggshell, but they told me they can't mix a Glidden color into a Behr paint. They did in the past. Without having a chip to color match into Behr, I ended up mixing the color in Ultra-Hide 220 eggshell. That moment I compromised the system. 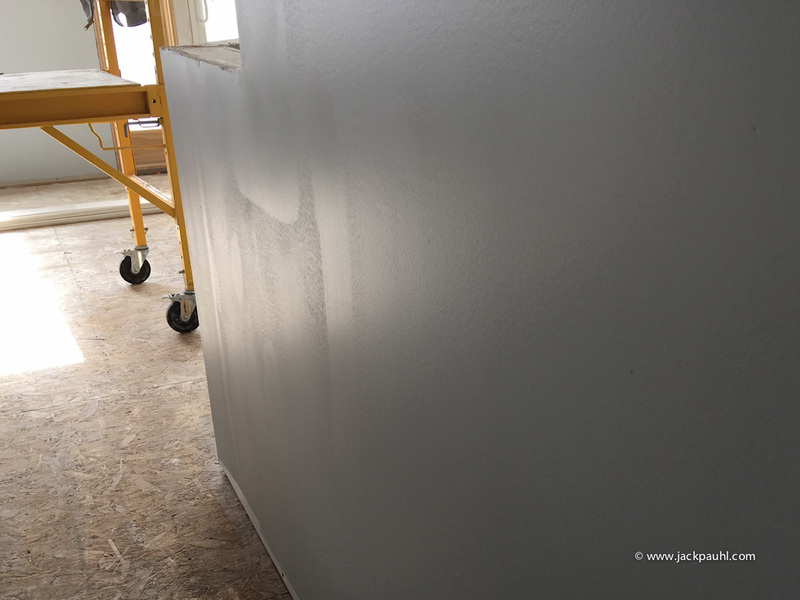 For many years we applied Glidden Ultra-Hide eggshell successfully over bare drywall in 2 coats, that was nearly 15 years ago. I am told the 220 line is not the same as the Ultra-Hide we used in the past. 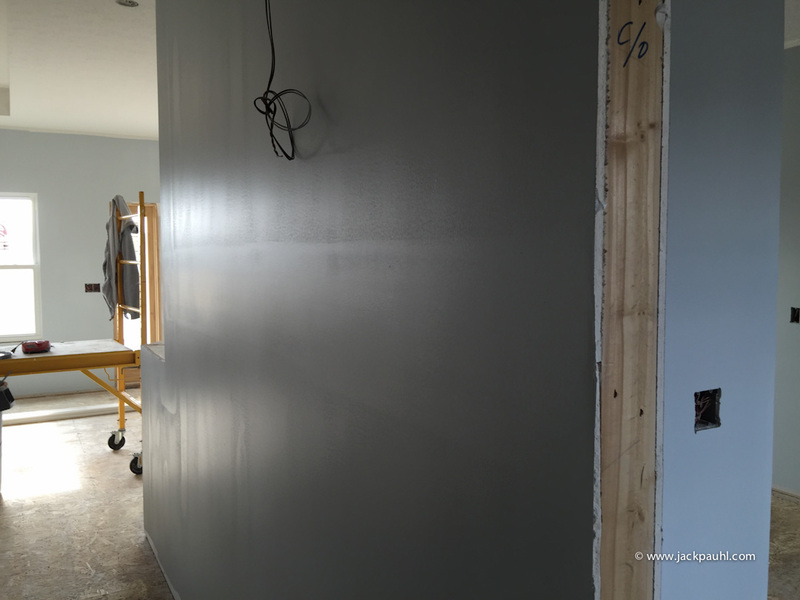 We always apply 2 coats of Behr Premium Plus eggshell on new drywall so I was hoping for 2 coats with Ultra-Hide 200. I knew within 30 minutes of rolling my first coat of 220 that I will need to roll 3 coats. I waited 4 hours after rolling the 1st coat before turning around and rolling a 2nd coat until I ran out of paint. The 2nd coat of Ultra-Hide was equivalent to 1 coat of Behr. Luckily I had enough paint leftover from the 1st coat to roll a good portion of areas that will save time later after the trim and doors are installed. I focused on re-rolling the baths, laundry, tight areas, kitchen and a few main walls. Altogether the house will get 3 coats of Ultra-Hide 220. My time plus extra paint would be $1,450 to apply the 3rd coat. It will be a bit less because I was able to roll 2 coats in some areas before trim and electrical hardware. 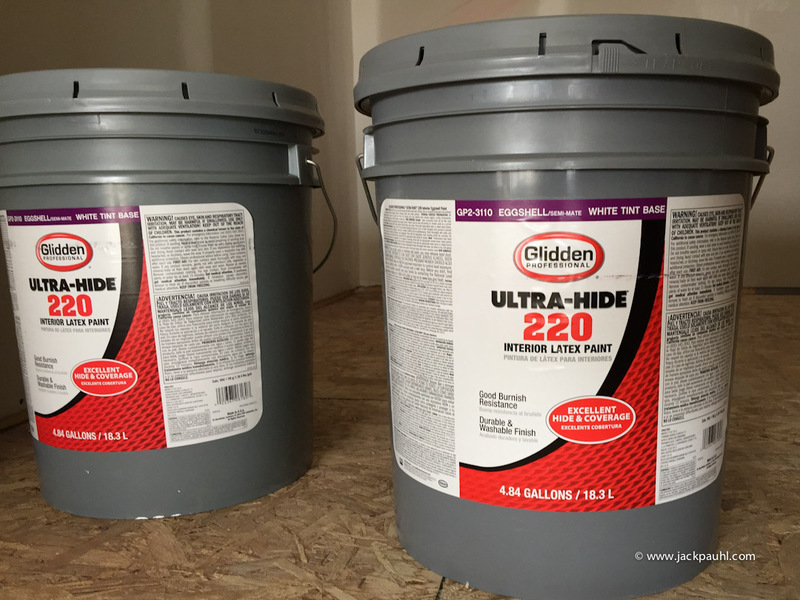 Glidden Ultra-Hide $84.98 which is $16.99 per gallon compared to Behr Premium Plus Eggshell at $113.00 or $22.60 per gallon (five gallon) pricing. These photos are after 1 coat of Ultra-Hide. The builder called with the color for a house I had to prime. It was a Glidden color. He provided the name and number of the color. I went to Home Depot to get the Glidden color mixed in Behr Premium Plus Eggshell, but they told me they can't mix a Glidden color into a Behr paint. They did in the past. Brian, It would have been cheaper and faster for You to either go get a chip from Glidden or have them mix 1 quart of glidden, go out to your truck, make your own sample, and then color match that to the Ultra. My Home Depot tried that crap on Me too, so I just cut off any trace of the Glidden number and then glue the sample to a piece of paper so they can't see the back, and then give it to them and get it color matched. It's sour grapes from Glidden because they are pissed off because HD pushes the Behr Paint, so Glidden reciprocates by saying they don't want any of their colors being used by Behr. Total BS. Question is, is that wall ever going to look good from an angle since you used the Glidden to prime with? Brian, I noticed that you roll tight to the edge of the drywall. I guess you don't experience getting the gypsum in your cover (?). Mike, I use a wood file and run it over the edges on the openings. The wood file has a handle like a screwdriver so its an easy one pass over the edges. It depends on which crew did the finishing. Sometimes its not required. I'm not sure if that wall will turn out ok. I thought the 2nd coat of Ultra-Hide 220 would look better than it did. I didn't bother cutting-in ceilings as usual so when I get back into production sometime next week, I'll end up doing the 1st coat cut with Behr eggshell.